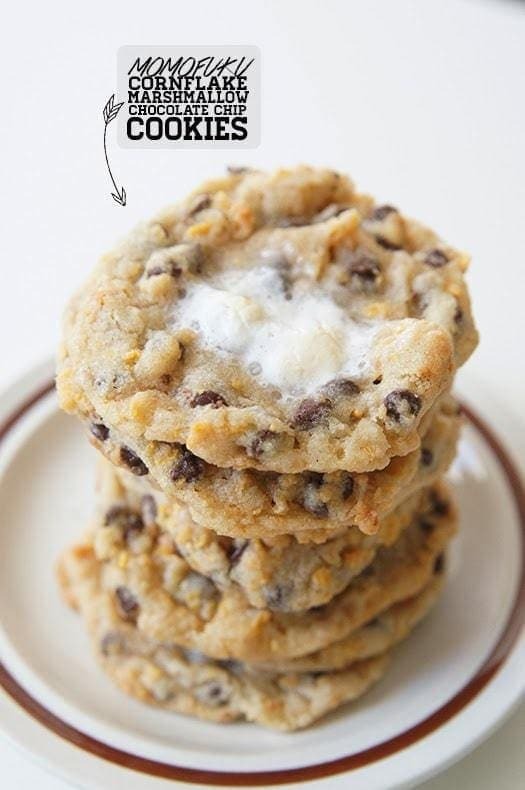 Milk Bar Cornflake Marshmallow Cookies just like the ones served in Momofuku Milk Bar in NYC! I think my version is even BETTER…and they’re easier to make! See my tips and tricks on making these incredible cornflake chocolate chip cookies in your own kitchen. These Milk Bar Cornflake Marshmallow Cookies were my Everest. First a little background, because, well, that’s what I do. I have this traveling wish list that is made solely of dining establishments. One such establishment on my NYC list is Mumofuku Milk Bar. Seeing as though we haven’t been back to NYC in a few years, and much to my chagrin, no trip is in our immediate future, I began the search to make their most famous cookies. Thanks to the amazing world wide web, I didn’t have to look too far. Against my nature, I followed the recipe to a T. I was so good! I mean, so good. I bought all the right ingredients (corn flakes!? Milk powder!? Eew.). I set my timer at each step. I even used the paddle attachment just like I was told to! I think I can finally say that I’ve figured out some tricks! Oh, and I am so happy. I mean, it’s far from the big apple, but my cozy kitchen is a happy place filled with the aroma of crunchy, gooey, cookie marvelousness. Good thing they’re worth it. 1. Combine the butter and sugars in the bowl of a stand mixer fitted with a paddle attachment, and cream together on medium-high for 2 to 3 minutes. Scrape down the sides of the bowl, add the egg and vanilla, and beat for 7 to 8 minutes. 2. Reduce the mixer speed to low and add the flour, baking powder, baking soda, and salt. Mix just until the dough comes together (no longer than 1 minute). 3. On low speed, paddle in the corn flake crunch and mini chocolate chips until they’re incorporated. 5. Heat the oven to 365°f (original recipe calls for 375, but mine burned at this temp). 7. Cool the cookies completely on the sheet pans before transferring to a plate or airtight container for storage. 1. Heat the oven to 275°f. 2. Pour the cornflakes in a medium bowl and crush them with your hands (or a cup since my hands felt like they were crushing glass after 30 seconds). Add the milk powder, sugar, and salt and toss to mix. Add the butter. As you toss, the butter will act as glue, binding the dry ingredients to the cereal and creating small clusters. 3. Spread the clusters on a parchment- or silpat-lined sheet pan and bake for 20 minutes, at which point they should look toasted, smell buttery, and crunch gently when cooled slightly and chewy. ^^ Mixing up the cornflake crunch. ^^ After adding the cornflake crunch and chocolate chips to the cookie dough. ^^ See! Burned, flat cow pies. Rounds 1-3 were no bueno. Batch numero quatro was much better. ^^ Lined up on a cookie sheet to chill/some to freeze. These are the ones “stuffed” with marshmallows instead of incorporated into the dough. ^^ Headed to the freezer for later (i.e. : the next day). ^^ The perfect finished product! Milk Bar Cornflake Marshmallow Cookies just like the ones served in Momofuku Milk Bar in NYC! I think my version is even BETTER...and they're easier to make! See my tips and tricks on making these incredible cornflake chocolate chip cookies in your own kitchen. Combine the butter and sugars in the bowl of a stand mixer fitted with a paddle attachment, and cream together on medium-high for 2 to 3 minutes. Scrape down the sides of the bowl, add the egg and vanilla, and beat for 7 to 8 minutes. Reduce the mixer speed to low and add the flour, baking powder, baking soda, and salt. Mix just until the dough comes together (no longer than 1 minute). On low speed, paddle in the corn flake crunch and mini chocolate chips until they’re incorporated. Heat the oven to 365°f (original recipe calls for 375, but mine burned at this temp). Pour the cornflakes in a medium bowl and crush them with your hands (or a cup since my hands felt like they were crushing glass after 30 seconds). Add the milk powder, sugar, and salt and toss to mix. Add the butter. As you toss, the butter will act as glue, binding the dry ingredients to the cereal and creating small clusters. Spread the clusters on a parchment- or silpat-lined sheet pan and bake for 20 minutes, at which point they should look toasted, smell buttery, and crunch gently when cooled slightly and chewy.